Today, I decided to utilize what initially appears to be the contradictory advice of two good friends. My goal is to give my metabolism a bit of a boost and, more importantly, wean myself completely from the vending machine at work. * Eating three meals a day and not snacking in between meals. * Eating real food — very little, if any, processed food — and making sure each meal includes a whole grain and a vegetable. * Making yourself learn to really savor a meal, slowly chewing each mouthful and taking at least 20 minutes to eat a meal. For the most part, I’ve been following these guidelines more closely over the past two-three months. I’m sure it has helped me lose some weight. One way I can tell it is working is I wake up hungry. If you don’t spend two-three hours grazing before you go to bed, eat dinner at about the same time every evening AND don’t wake up to snack in the middle of the night, you WILL wake up hungry in the morning. On most mornings, I get up by 4:30, make some coffee, eat a bowl of oatmeal and head for the Muscatine Community Y, where I work out from about 5:30-6:30. The only problem with this — especially on the mornings after pretty hard resistance training — is that I am really hungry again by 9:30. Marnee Acker, another friend who teaches the circuit-training class I’ve been attending on Monday mornings, always advises everyone to make sure they eat some protein after working their muscles in her class. She told me several months ago I should buy some whey protein powder to either mix in with my oatmeal or to mix with milk and drink as a shake. I finally bought some today. Hang around a gym long enough and someone will tell you to eat four to six smaller meals a day instead of the traditional three meals. I don’t completely buy into this. For one thing, it’s a hassle and most people, including me, aren’t disciplined enough to do it. And, eating three really good meals a day helped me lose a lot of weight when I worked with Jill. 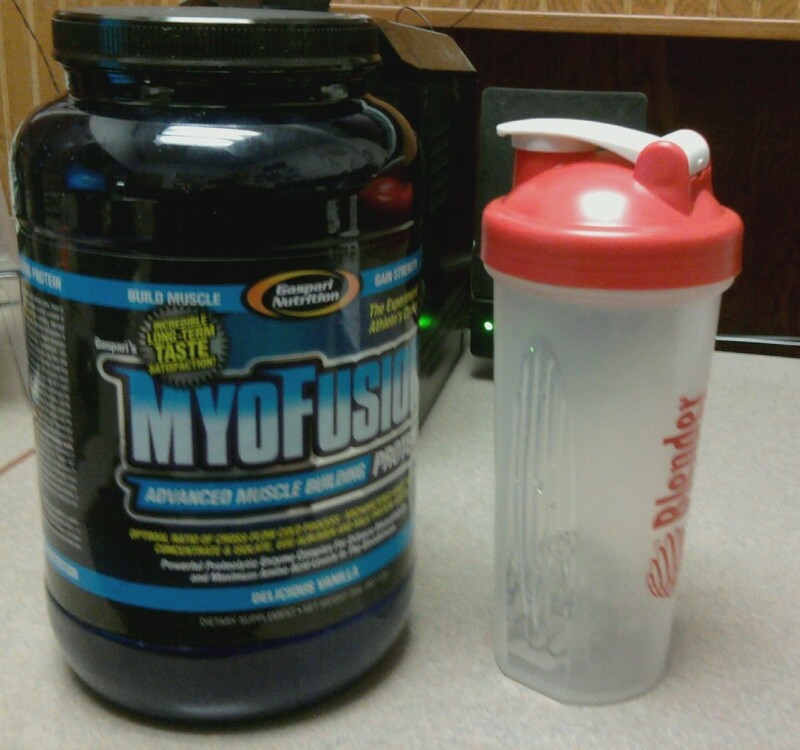 But I’m going to try using the protein powder mixed with skim milk to make a shake as a fourth and maybe even a fifth meal on the days when I’m hungry at 9:30 a.m. or 4 p.m. I’m going to listen to Marnee because she also told me several months ago that I needed to lift weights more often and that I needed to lift heavier weights. I’ve been following that advice, which I’m pretty sure has had a big impact on how my clothes are beginning to fit and the weight I’ve lost. 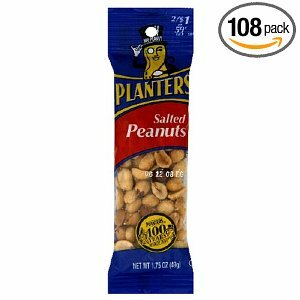 Peanuts: 290 calories, 25 grams of fat, 13 grams of protein. Shake (plus 12 ounces of skim milk): 278 calories, 3 grams of fat, 37 grams of protein. Best of all, I tried a shake today and it tasted great. And it easily left me feeling full for 2-3 hours. The guy who runs the vending machine at work may be noticing a significant drop in revenue. I couldn’t sleep last night. Went to bed around 10 and immediately fell asleep only to wake up around 12:30. Tried everything and could not go back to sleep. This is dangerous territory for me. It’s too easy when this happens to wander down to the kitchen and eat things I don’t need at a really bad time to eat them. Somehow, last night I managed to stay out of the kitchen. Instead, I stayed upstairs and read until I finally fell back to sleep. I worked up mucho sweat today leading a cycling class at the Y. Afterward, I weighed myself. I am down 13.5 pounds since the Y’s Weigh, an annual weight-loss contest began on Nov. 1. Still a long way to go, but at least I’m headed back in the right direction. Protein shakes are a great way to get much-needed protein fairly easily!! The smaller meal idea is really ideal if you work out, but stick with what is working for you right now. You can always change it up later on. BTW- I wake up hungry every morning. I love breakfast!! You have inspired me to do better than the chemical-laden Slimfast breakfast bar I usually eat. It isn’t enough calories to sustain what I do-even though it takes YUMMY with my coffee!!! I love oatmeal. I like egg whites. This is an area where I can certainly improve my nutrition. Thanks, Chris…..and keep it up!!! You do look great!! It seems like you are feeling pretty good too-that is awesome!!! !